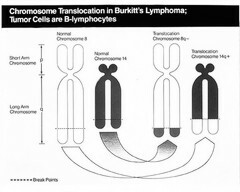 Schematic diagram of chromosomes 8, 2, 14, and 22 which are involved in the translocations (usually 8;14, less frequently 8;22 or 2;8) which occur in Burkitt's Lymphoma. The break points for these translocations are identified by the banding regions (q24, p13, q32 and q11). These break points on chromosomes 2, 14, and 22 correspond to chromosomal regions to which have been mapped the kappa, heavy chain and lambda constant region genes respectively.